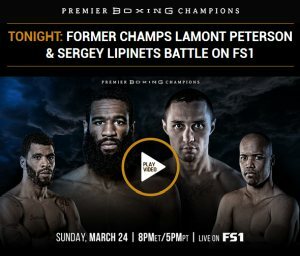 TONIGHT, former two-division world champion Lamont Peterson battles once-beaten former super lightweight world champion Sergey Lipinets, live on FS1 from MGM National Harbor in Oxon Hill, Maryland. In the co-main event, once-beaten contender—and Lamont's younger brother—Anthony Peterson battles former super featherweight world champion Argenis Mendez. Fists start flying at 8pm ET/5pm PT, but for even more boxing, tune in to prelims on FS1 at 6pm ET/3pm PT. For complete fight night details and undercard information, CLICK HERE.